Does the V2 use the same base plates? mhackney wrote: Does the V2 use the same base plates? No, they are a bit different. But may not make a difference to how your FSR plate mounts. Of course the files are on github. I meant the plates that attach to the front of the base cabinet that the 2 drawer print I made above would fit. The FSR Plate will work on all versions of Rostock MAX from V1 to V3, I've verified that already! Oh, I'm not sure about that. But I think the v2 & v3 bases are different heights. It's at least similar, however the issue would be just how much is in the base of a V2 (I don't even want to think about trying that on mine), I suppose that especially on the rail supply ones, that the leftward side has some space for it, but if you put an SSR and control relay in, you lose a lot of that. Even more if you also use a safety relay with thermal fuses. But a panel with just the niches for nozzles at an angle would be really nice (I am honestly tempted to do one up for the top side of mine, on the right, with 2-3 rows of say, 8 each, for all my nozzle sizes and the 3 materials I'm interested in (Would love to see the .15 in a copper nozzle, personally). I think it would fit. Ok, I've updated all the files on TV and two members have verified the "stock V3" versions work perfectly in the stock V3 base. As an apology for bone-headedness, I created two different small drawers too. So you can choose from a simple drawer or a drawer with nozzle holders for either of the two drawers. I get asked this all the time so here's a little overview on how to go about designing purpose-built supports for your models. You can also use these techniques to add supports to STL models in exactly the same way, all it takes is a CAD program that can open STL files and can generate meshes and save them as STL files. Modeling supports is easy, all you have to do is learn to "think like a 3D printer". What I mean by this is, when you are designing your parts think about what the printer need to do to print them. Many times you'll discover other simpler options to design the part so no supports are needed. But in the cases where you have no choice but to use supports, thinking like a 3D printer will help you design them. Let me start with a few simple, what I call, Supporting Rules. First, explore all options to obviate supports. Think about reorienting the model, breaking it into several parts that can be printed without supports and then fastened together, or even rethinking the design. Ok, supports are necessary, so the first rule is to minimize the interface - the surface area - between the part and support. Less is more. Think of ways to use as little support to hold up more model. Shapes like Ts, I beams, ridges and ribs all minimize the surface area. Separate horizontal flat surfaces by 2 layer heights. So if your layers are .2mm, leave a .4mm gap between the top of the support and the surface of the model that's being supported. Separate vertical walls by at least 1 wall thickness, so for a .4mm extrusion width, keep the support .4mm away from the model. Save the model in one file and the supports in one or more separate files. The choice mostly depends on your slicer and printer. For instance, if you have dual extrusion, you might dedicate 1 extruder to support material. Most slicers will allow you to associate each extruder with separate STL files so you would use option 2 in this case. If your slicer allows you to have different slicer settings for different sub-models in the same file, you can save everything in one 1 file. Then, in your slicer you can choose "fast printing" options for the supports - like 1 or 2 perimeters, 1 shell layer and very sparse infill. You can either make the entire support structure the zig zag like the one in the photo or put a 1 or 2 layer hight zig zag on top of a more solid support platform in order to cut down bonding surface area. All of the above can also be used to add support to an existing STL file. Organic shapes like figurines (Yoda!) might be more challenging so auto generated supports might be a better option. 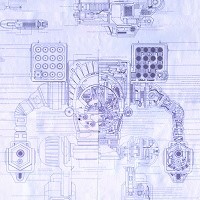 I design primarily functional and mechanical things so the "Supporting Rules" work well. I just set up FSR probing on my Max v3 and, just as you say Michael, it is absolutely dead on, every time! 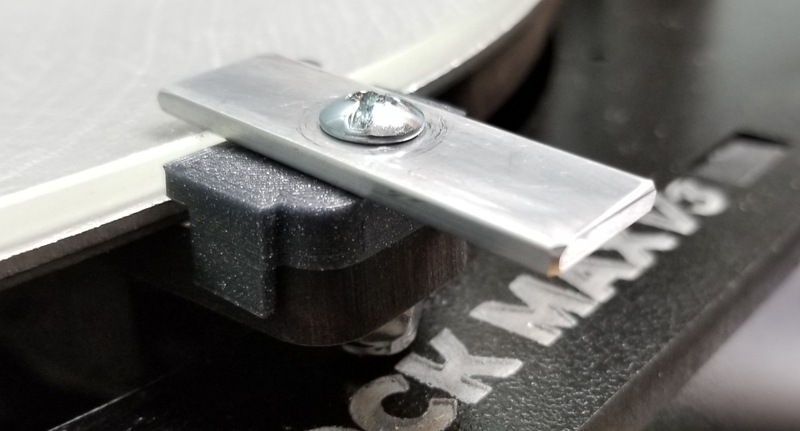 I purchased the FSR Plate from Trick Laser, along with just about every thing else Brian offers, but am stumped about how to clamp the glass on to it. 1. Three of the Duet's 13 point calibration points are positioned so close to the three hold down ears that the hold downs, whether binder clips or the stock blue clamps interfere with the three stock layer fans and the Trick Laser LED ring. 2. The mounting hole in the hold down tabs are much farther away from the edge of the bed than the stock holes are. Because of this, the stock blue plastic hold down clamps don't quite reach the glass to hold it down. 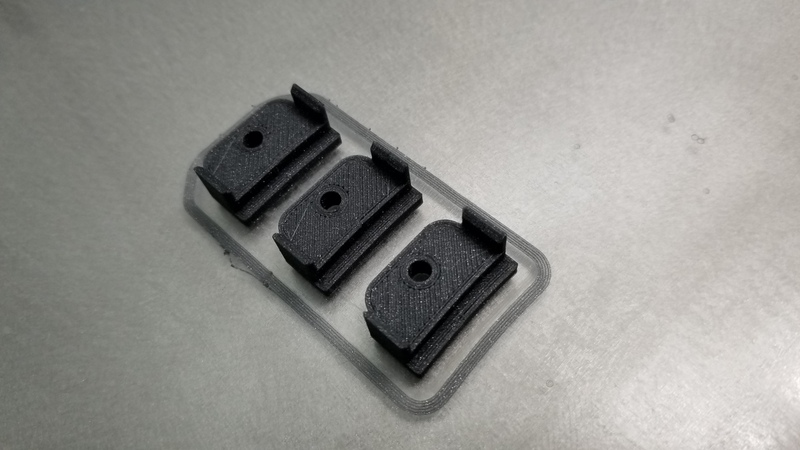 The workable solution I have found for both of these issues is to use binder clip hold downs positioned half way between the ears and the position of the FSR sensors. While this works, it doesn't sound like it is intended and so I am wondering if I am missing something. I would greatly appreciate any suggestions. 1) You can change the calibration points and David has a calculator on his web site that generates the g-code for you. Sounds like you are probing at too large a radius. 2) Yes they are, I didn't intend to use the blue clamps as I find them too flexible. I use a small strip of aluminum. A simple printed clamp would work well too. I'll draw one up later tonight. I just generated new probe points, however the stock fans spread so far out from the nozzle, with a fan pointing in the same direction as each hold down ear, so that bringing in the probing radius doesn't make a difference. No worries, I'm replacing them with the Berd Air kit and bringing in the radius will help the led ring clear the hold downs. I very much appreciate you drawing up some hold downs, however I like the sound of the aluminum strips. Could you post some photos of them instead? Michael, no hurry, at all! The binder clips are working fine and I can come up with an aluminum clip. I didn't describe the situation with the fans well - making the radius smaller didn't make the fans interfere with clips, it's that the fans continued to brush the clips before and after the radius change. 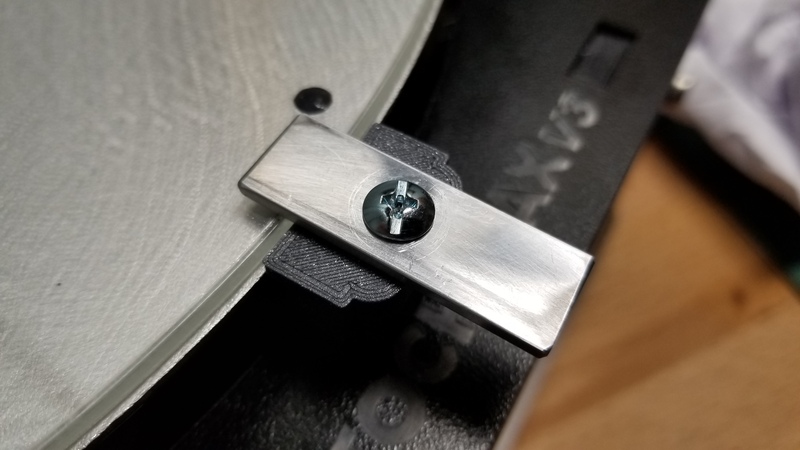 For context, this post is regarding how to hold down the glass and (optionally) heat spreader on the Michael Hackney designed and Trick Laser implemented FSR bed plate. The issue is, because the glass and heat spreader lay on top of the FSR build plate and the screw holes for securing the clamps on the hold down ears on the plate are farther away than the stock holes, the stock blue plastic clamps do not work. Simple binder clips do work, however they are tedious to use. So, I designed my own hold downs after Michael said he used small aluminum strips for his clamps. 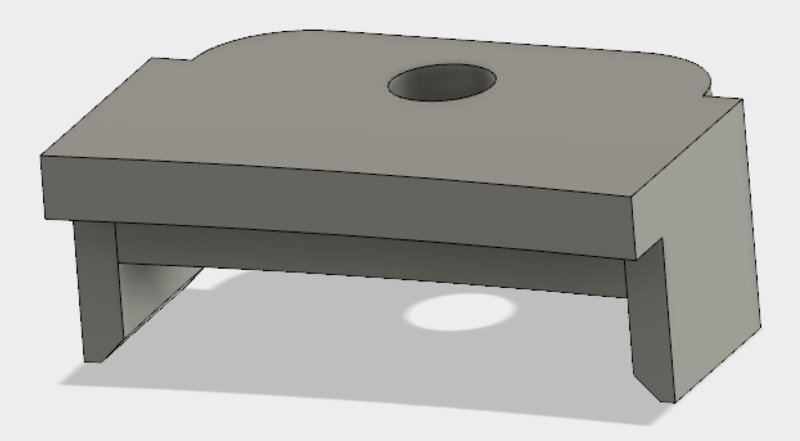 I thought about printing the entire clamp, however I wanted something small and very low profile and figured using aluminum for the hold down part would work better. I did print the spacer under the aluminum strip clamp. I had also been running into the problem of the stock fans hitting my hold downs during the Duet's 13 point calibration. The solution was to rotate the probe points in the Duet's bed.g file 45 degrees using trigonometry. Here's what I came up with for the bed hold downs. The printed part is the spacer, with the clamp itself being an aluminum strip.